Hawaii Strategic Highway Safety Plan | All Hawaii's road users arrive safely at their destinations. Hawaii Department of Transportation releases a new geocoded map. Hawaii Department of Transportation has released a new type of map. This geocoded map includes the quantity of fatal crashes from 2012-2016, current Hawaii Department of Transportation projects, and future projects. The map provides informative information about the leading factors involved in fatal crashes on state and county level. Production of this map aligns with one of the core data strategies outlined in the Strategic Highway Safety Plan, which is to provide timely crash data in order to inform decision making with roadway projects as well as other safety countermeasures. While everyone is out getting ready for “Back to School” lets “Get Back to Basics” with pedestrian safety. Since we are all pedestrians at some point during our travels, lets practice driving like driving as though someone we know might be the next person we come across trying to cross the road. Check out KHON2’s latest Arrive Alive episode to be reminded of our responsibility to look out for pedestrians while we are driving. 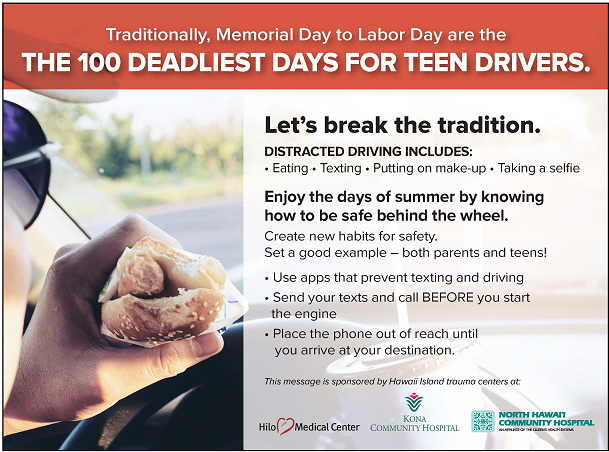 Big Island Trauma Centers Work Together Share Important Messages with their “100 Days of Summer” Traffic Safety Campaign. Kona Community Hospital, North Hawaii Community Hospital, and Hilo Medical Center wants you put away your distractions so you can enjoy your Ohana this summer. The “100 Days of Summer,” campaign aligns with what is notoriously the most dangerous time of the year, from Memorial Day until Labor Day, according to the National Safety Council. The campaign incorporates locally crafted multi-generational messages about the current distracted driving law, ongoing enforcement, the cost and potential burden of a distracted driving violation, and the importance of pledging to exhibit positive behavior for our friends and family. 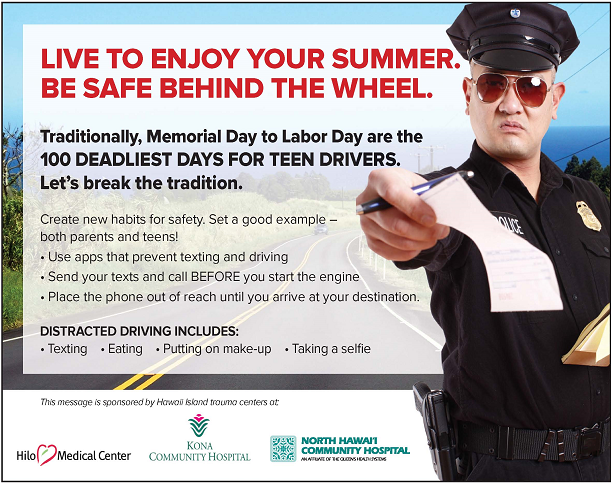 • Finish electronic device conversations before you start your engine. • Make a habit of putting your phone out reach and out of view before driving. • Avoid a bad makeup mistake or a dribble spot on you shirt, by not eating and grooming while driving. Police ramp up pedestrian-related enforcement prior to pedestrian safety month. August is right around the corner. For many of us that signals, back to school. For traffic safety professionals, August is the beginning of Pedestrian Safety Month. KHON2 covers how enforcement is not only individuals for jaywalking and disobeying traffic signals, but also addressing drivers for not yielding to pedestrians at a crosswalk. The start of 2016 has unfortunately proved itself to be consistent with previous years in the high volume of pedestrian fatalities. With a swath of prevention efforts from public education campaigns, public service announcements, and community stakeholder meetings, enforcement of speed and pedestrian-related laws, there is no shortage of efforts to counter pedestrian related collisions. This warrants taking advantage of new learning opportunities that can help us get us up to speed on current countermeasures aimed at making an impact. Federal Highway Administration (FHWA) and the Pedestrian and Bicycle Information Center has posted all 12 of a 12-part series on Countermeasure Strategies for Pedestrian Safety In addition, FHWA has encouraged Strategic Highway Safety professionals to review and adapt where applicable the Handbook for Designing Roadways for the Aging Population into the statewide plan. This recipe book is composed of non-alcoholic or mock cocktail (aka “mocktail”) recipes specially created by some of Hawaii’s top mixologists. We hope that you enjoy these non-alcoholic alternatives during your next celebration with family and friends. We would like to thank the members of the Hawaii Chapter of the U.S. Bartenders’ Guild for donating their time and talent in creating these original mocktail recipes. Thank you, also, to DTRIC Insurance for its partnership and shared efforts on this initiative. The Drive Sober or Get Pulled Over Impaired Driving Awareness campaign is funded through a grant from the National Highway Traffic Safety Administration (NHTSA). 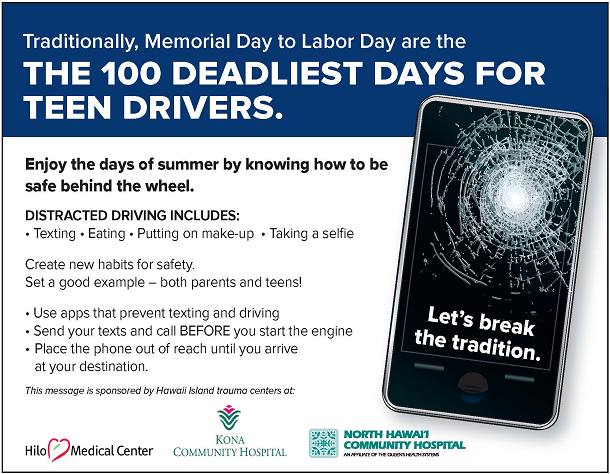 NHTSA and the Hawaii Department of Transportation are committed to preventing traffic crashes and fatalities caused by impaired driving. Two exciting things in traffic safety are happening this month. First, August is Pedestrian Safety Month, so as we are out doing our daily activities, errands, and recreation, let us remember to drive and walk distraction free and with attention to one another on the roadways. The other good news is KHON2 has teamed up with the Department of Transportation to run a 6 part “Arrive Alive” series featuring 5 traffic safety topics. There are two segments this month specifically aimed at Pedestrian Safety. Since each and every one of us is a pedestrian at some point in time, its important for us to watch, learn and share.